Planning a trip off island and need a presence in your home for security reasons or to feed animals, don't hesitate to call us. An empty, deserted home is a temptation to would be robbers. Returning from vacation to find you are the victim of an opportunist can cause distress and anxiety. Your home is a valued possession and you will want to have your assets protected in your absence. Don't take a chance; call AAA Caregivers, who will provide responsible persons to stay in your home and deter robbers from gaining access to your cherished possessions. Please complete the application form for a house sitter and submit to the agency ,after which, we will send you further information including a quote. We are pleased to offer assistance in sourcing nursing care. Once we know what your nursing requirements are, we will source the best possible person whom we can recommend to meet your needs, albeit personal or for a family member. Please complete a basic questionnaire, submit and we will respond promptly. AAA Caregivers offers fulltime or part-time housekeepers who provide cleaning services in private homes, condos, apartments or offices. Housekeeping services are provided to help relieve the burden of maintaining your home in a clean, tidy and organized manner. Clients maybe busy, studying, traveling or simply busy with more important family concerns. Some parents are just too tired to clean, but like to see the home clean and tidy, with pleasant odours. This is where we can be of service. We offer a cleaning service for a minimum of 4 hours morning or afternoon and we also provide fulltime helpers who can work 8-9 hours per day. Service maybe once for the week or more depending on the need. Cleaning may consist of sweeping, moping, cleaning all surfaces, utilities, fans, shelves, dusting and sweeping. Staff are made aware of the importance of doing a good job from the beginning. We also offer full-time caregivers who just take care of a child or children in the home. Complete the questionnaire, email us your request and we will send the booking form with our rates. These services are also offered to short term visitors or long term residents at private residences, suites, villas, condos or apartments, island wide. 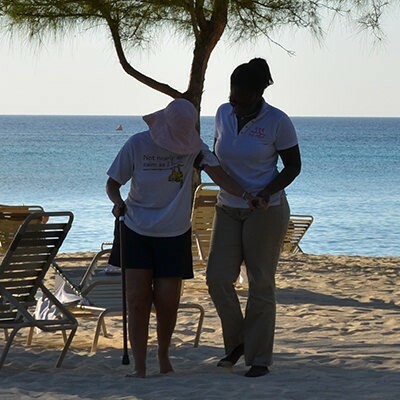 The quietness, peacefulness and gentleness of the Cayman Islands makes them a haven for persons, who, for the most part, able to care for themselves, with some support services. Whether you require help cooking, cleaning, bathing, dressing, walking, driving, shopping, our caregivers are more than willing to assist you. Contact us and let us know your needs and we will provide you with the most suitable Caregiver we can find. For those who are not in need of Nursing Care but require support, the questionnaire below can be completed and submitted and we will respond promptly. For persons requiring nursing care, complete the nursing care questionnaire in the appropriate section. To our visitors: We want your stay to be as pleasant as possible. AAA caregivers are pleased to provide maid service on a daily or weekly basis. Our minimum number of hours is 4 and maximum is up to 9 hours per day. Complete the questionnaire below and submit and a quote will be provided. Quotes cannot be made until all requirements are completed on the questionnaire provided on this site. Maid service cleaning is a “Sparkle Clean Service"? which must be inspected by the client following completion of the job. The aim is to "Always ensure customer satisfaction". An Agency inspection is available on request. Maids providing service are aware of the trusting relationship formed when allowed access into your private living and working spaces. Honesty at all times is a hallmark of AAA Caregivers Agency.